The villa is a few minutes' walk from the village of 'Cabanas' where you can find excellent restaurants, cafes, bars, supermarkets and all you might need. The villa is fully equipped and very comfortable. The ground floor comprises a large lounge-dining room which leads via two large patio doors to two large terraces one of which overlooks the private swimming pool set in a lawn garden with a BBQ. The terrace has sofas and dining furniture, perfect for al fresco dining on the warm Algarve evenings. Also on the ground floor there are two large twin bedrooms, one bathroom and a completely equipped kitchen. Upstairs there is a master bedroom with en-suite bathroom and a terrace overlooking the garden. An ideal place for sun, beach, golf and fish lovers! The Eastern Algarve: The Eastern Algarve is considered to be the most picturesque part in the Algarve. The Ria Formosa Natural Park is host to a large migratory bird population and is just a few minutes walk from the villa. The Portuguese town of Tavira only about ten minutes by car is known as the most beautiful town in the Algarve and recommended for its historical past, Roman architecture and 37 churches. Throughout the year there are music events and festivals and many more activities across the whole Summer. Tavira also has a fabulous daily market where you can buy fish straight off the boats and meat, fruit and vegetables from the local farmers. 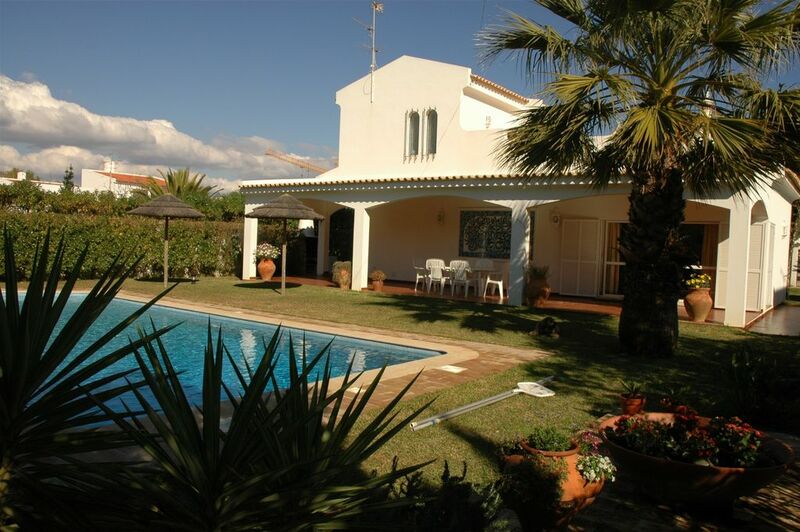 Location: Cabanas is 30 minutes drive from Faro airport and only 30 minutes drive to the Spanish border. So, if you wish you may easily take a day trip to Spain whilst you are there!. In Cabanas you will experience a relaxing holiday in beautiful surroundings in an authentic Portugal! Beaches: Tavira's coast is integrated in the Natural Park of Ria Formosa, a protected area which is characterized by having a high biological productivity and diversity of habitats. Tavira has a coastline measuring over 18 km long, comprising the islands of Tavira and Cabanas, which are part of the Ria Formosa barrier islands' system. Cabanas' island is the smallest of the islands within the Ria Formosa Natural Park. It is 70 meters wide and 7 km long (variable figures), providing an excellent choice for anyone who enjoys a quiet and lesser frequented beach. This golden beach, full of shells and a warm turquoise sea is located in front of Cabanas' village, land of fishermen. Cabanas beach has been distinguished with the Blue Flag Award since 1989 and it has equipment and infrastructure services available to visitors. To get there you take a fishermen's boat across the Ria Formosa for a few minutes. There are other magnificent beaches nearby, all easily accessible by car. In the pantry you can find the ironing board, iron, backet, broom, etc. There are several water activities and boat trips in the Ria Formosa Nature Park. Kite Surf School in Cabanas Beach The kite surf school runs in Cabanas beach during the Summer months. They provide the equipment. Near the villa there are six splendid golf courses overlooking the country side and the Ocean. Bedlinen and towels are provided except towels for pool/beach. We offer a weekly linen change except for long term rentals. A gardener will water the garden every day in the Summer and when necessary in the Winter and a pool expert will look after the pool to keep the water in perfect condition. We have just returned from 2 great weeks in this beautiful villa. It is extremely spacious and very clean. The pool and gardens are well maintained. My husband and I had previously stayed in Coco Loco and liked our stay so much we invited family this holiday. They were equally impressed. What's not to like!! A short stroll take you into Cabanas with many restaurant and shops. Teresa, the owner, is most helpful and easy to get in touch with. Hopefully, we will return very soon. Thank you very much Gwen and Derek for the great Review. It makes me very happy to know you enjoyed your holidays in my villa to such an extend that you have already booked for next Summer. I am the one to thank you for looking after the villa. Wish you all the best. We have just spent a wonderful 2 weeks at Vivenda Coco-Loco. The owner, Teresa, was so helpful right from our initial enquiries and it was reassuring to know that lovely Margerida(who looks after the villa) was always available if we needed any help during our holiday. The villa itself is fantastic and very spacious. We were a family of 4 (3 adults and a teenager) and had more than enough room-the villa would easily accommodate 6 people. The villa was spotlessly clean and well maintained :the outside area is particularly great. The pool was large, the sun loungers comfortable and there was lots of shade if required. The villa is centrally positioned- 5 minutes walk to the shops, restaurants and the boat across to the beach. A wonderful place for a relaxing holiday! We have been on many villa holidays in the last 10 years and this villa is one of the best we have stayed in. Coco Loco had excellent facilities, was well maintained and the pool (which was big) and gardens were lovely to relax in. We really enjoyed having barbecues and sitting out all evening. The villa was a short stroll from the river front where you could get a water taxi across to the beach. There were also many bars and restaurants close by and a couple of supermarkets that stocked a good range of products. Teresa, the owner, was very helpful during the booking process and provided a lot of information about the area including places to go and restaurant recommendations. Check in was carried out by Margarida who was very helpful and accommodating. Overall, we had a wonderful time and would reocommend Coco Loco and Cabanas to anyone wanting to stay in this part of the Algarve. Villa Coco Loco is a beautifully well presented home in a perfect location for exploring the village of Cabanas. We have holidayed in Cabanas on seven other occasions and this Villa with its spacious rooms, well maintained gardens and superior swimming pool is without doubt the best place we've stayed. Spotlessly clean on arrival and well equipped throughout. Cabanas is an increasingly popular location in the eastern Algarve with its fabulous beach and lagoon and possesses a subtle blend of sleepy fishing village by day and its vibrant bars & restaurants by evening. Villa Coco Loco is only a short stroll from the promenade with its numerous shops & bars. A huge thank you to the owner Teresa and indeed to Margarida who was so friendly, helpful & informative upon our arrival. Perfect for all age groups. something for everyone. This was our second visit to Villa Coco Loco as we enjoyed the first visit so much! The house was exactly as we remembered it - spotlessly clean and tastefully decorated. The garden is well kept (the gardener came to water the plants while we were there) and the pool is also clean and well looked after. There is an outdoor dining table and chairs, a sofa set with coffee table, and a hammock (great for reading in the sun!) The house has all the facilities you could need and I was glad to see the addition of a coffee maker in the kitchen! Previous occupants often leave inflatable items for use in the pool and there were three bodyboards in the garage when we visited, which the kids loved using to surf the waves at the beach. The villa is in a very peaceful location and only a 5 minute stroll from the waterfront. We really love Cabanas - the people in the local shops and restaurants are so friendly and welcoming and, for such a small town, there is an amazing array of high-quality restaurants. We recommend Pizzeria Roma, Cabanas Brasserie (tucked behind the modern church right by the villa), Atlantis and The Ideal. There is also an Indian takeaway in the village now too. The beach is reached via small boat (1.5 euros per person for the round trip across the Ria Formosa) and the sand goes on for miles. There is a cafe there too although it was very busy and also expensive so would definitely recommend taking your own food/drinks. Thank you again Teresa for a wonderful stay - we will be back again I'm sure! It was a real pleasure to have you and your family again this year. You are mostly welcome whenever you feel like it and it makes me extremely happy to know you really enjoyed your holiday in my villa. I am the one to thank you. The Eastern Algarve is considered to be the most unspoilt and picturesque part in the Algarve. The town of 'Tavira', only about ten minutes by car from 'Cabanas' is known as the most beautiful town in the Algarve and recommended for its historical past, Roman architecture, 38 historic churches and its four beautiful bridges spanning the Gilão river which divides the town and allows for spectacular riverside views of the medieval town and river life. Numerous cafes and restaurants line the river, public gardens and quiet squares offering an array of traditional patisseries and fresh fish restaurants. The castle walls border the medieval centre of the town, from where you can enjoy a fantastic view of the rooftops of the town leading to the estuary and out into the Atlantic. 'Tavira' also has a fabulous daily market where you can buy fish straight off the boats and fruit and vegetables from the Algarve local farmers. CASTRO MARIM GOLF, a luxury complex being the Grouse Course, the Atlantic Course and the Guadiana Course. An excellent combination of 2 times 18 holes can be played from these 3 courses. They are all a challenge to both the novice as well as the more accomplished golfer. There are a number of other golf courses in close proximity along the Algarve. Notes on prices Prices are per property per week in UK pounds. Payment in euros is considered under request. To make the booking I require a deposit of 25% of the total. The balance should be paid 8 weeks prior to arrival. If that amount is not paid on time I shall consider, after contacting you, that you are not interested in renting the villa. The 25% deposit will only be returned if I am notified 10 weeks prior to arrival, otherwise it shall be forfeited. If you do a transfer please make sure that your bank does not charge interest which is deducted from the amount you deposit into my account, if that is the case you will need to cover it. There is a damage deposit of 250,00 Euros which must be paid on arrival and shall be returned at departure less the cost of any damages or extra cleaning. Air Conditioning is included in the rental rates during the months of May, June, July, August and September. From October until the end of April hot aircon is paid apart at 50 Euros per week. For long term rentals during the same period, water, electricity and aircon is paid apart and according to use. WI-Fi is included in the price Booking Notes Rental rates are for a maximum of 6 people + baby. For an extra person more than 6 there will be a charge of £ 20,00 per day that will need to be paid with the final payment. A child's cot and high chair are available free of charge. Weekly change of towels and bed linen is included in the price. Please inquire about additional extra cleaning / maid service. Beach towels are not provided. Changeover Day: All bookings are from Saturday to Saturday. The property is booked from 4pm on the day of arrival through 12am on the day of departure to allow time for cleaning and preparation arrangements.